Originally published in 1979, this book is a history of American nuclear weapons policy that tells how the United States learned to live with the bomb. Little of what has been written about nuclear weapons is historical. Most people concerned with the problems of nuclear armaments have asked 'what is to be done?' rather than 'what has happened and why?' 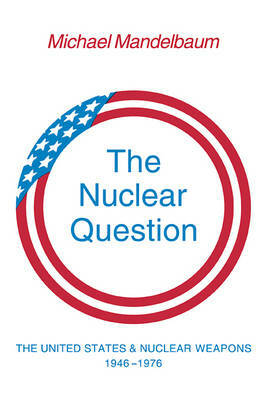 But The Nuclear Question is more than a chronology. It offers original and provocative arguments about the development of military strategy and arms limitations with the Soviet Union, and focuses in particular on the Kennedy administration. During that period the innovations of Secretary of Defense Robert S. McNamara, the Cuban missile crisis, and the Limited Test Ban Treaty combined to establish the main lines of nuclear policy that the United States follows today. This book will have great appeal to specialists who follow the technical developments of armaments and the political responses to those developments and to the general reader who does not feel at home in discussions of throw-weights, cruise missiles and MIRVs. Written in a clear, readable style, The Nuclear Question will be a valuable book for anyone who wishes to understand better the nuclear issues of our time.